A list of types of Muay Thai knockouts in professional fights. Muay Thai is a spectator sport and the rules allow for spectacular finishes. Fighting techniques used by Thai kickboxers are very powerful and the use of knees and elbows makes them very effective in a fight. Let's take a look at different types of finishing moves in Muay Thai. Those types of strikes often leave a nasty cut on a forehead. Spinning back elbows are especially powerful but it is also possible to deliver KO by an elbow slash from a short distance (or from a clinch). Elbow strikes are very effective at close range. Fighter can utilize them to cut the opponent's forehead to obscure his vision. The cut may also result in TKO. One can also knock out the opponent by hitting his chin with an uppercut elbow slash. Knee strikes are one of the most powerful techniques not only in Muay Thai but in martial arts in general. Knee - especially a flying knee - hits the opponent with an extraordinary force which may lead to instant KO. Knee strikes [side knees] are also very effective for wearing down the opponent in a clinch. A Flying knee strike is more sophisticated than a regular knee strike and it requires a great accuracy and timing. When the fighter hits his opponent's head with this type of strike the KO is almost guaranteed. And if he misses it and hit his opponent's body instead the impact of the hit will still be substantial enough to make him feel it. The possible defense against a flying knee would be a push kick to an opponent's rear leg. One can also parry a strike with his hand and then counter with a low kick. Muay Thai high kick targets an opponent's neck, not his head. The neck is a primary target of this type of strike. And the kicker strikes with his shin, not his foot. Those powerful kicks are often used in K1/Glory kickboxing, UFC and other MMA competitions. This type of kick generates a great power distributed on a small surface of a shin and it is equivalent to an impact of a car at 35 miles per hour (55km/h). Take a look at those combinations which utilise the most powerful strikes: headkicks, low kicks [leg kicks], round kicks, elbows and punch combos. 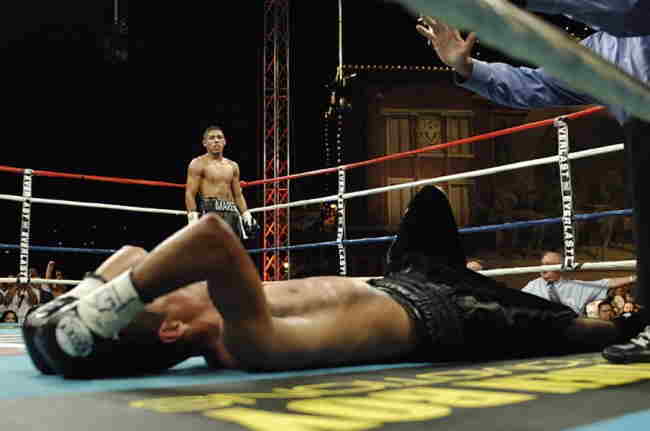 After all, to KO your opponent is the surest way to win the fight.